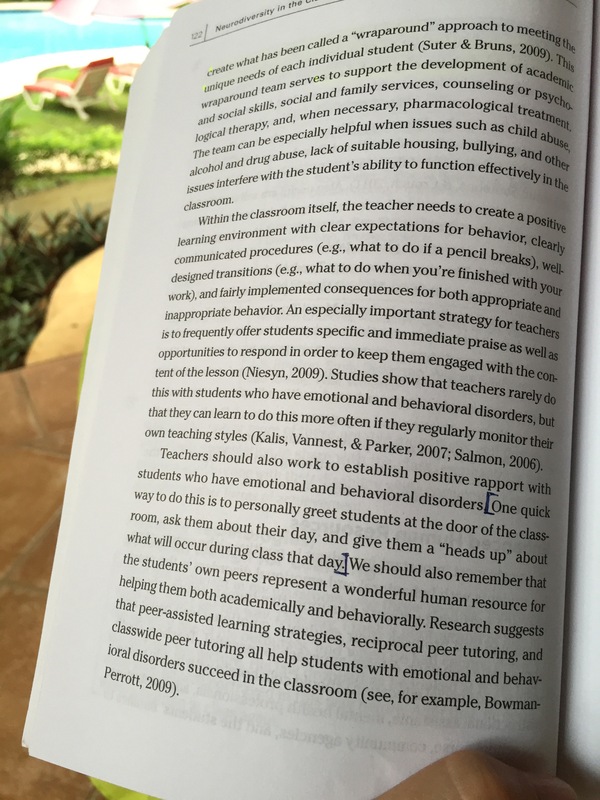 Chapter three in The Differentiated Classroom is titled Rethinking How We Do School – And For Whom. 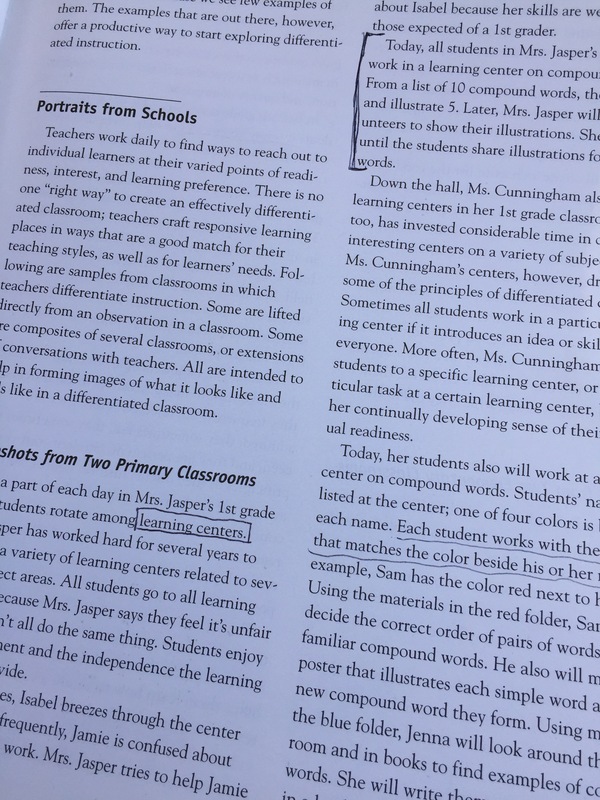 It was a little too common sense for me and didn’t provide me with the type of information I came to this book for: specific differentiation strategies I can use in my own classroom. 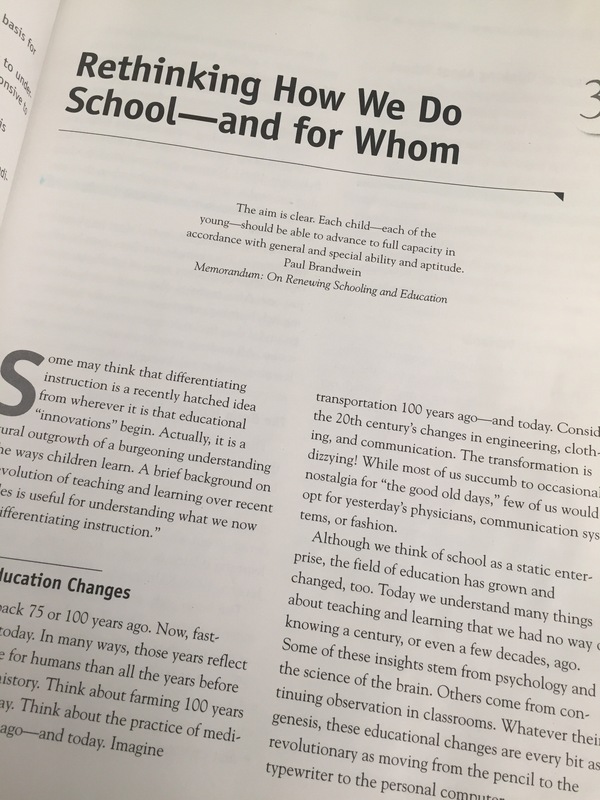 The chapter discusses the fact that school has changed substantially in the last 100 years, and so have students. While many different types of students did not attend public schools years ago (students from poor families worked, students from rich families went to boarding school, physically disabled students were homeschooled, etc.) significantly more attend today. 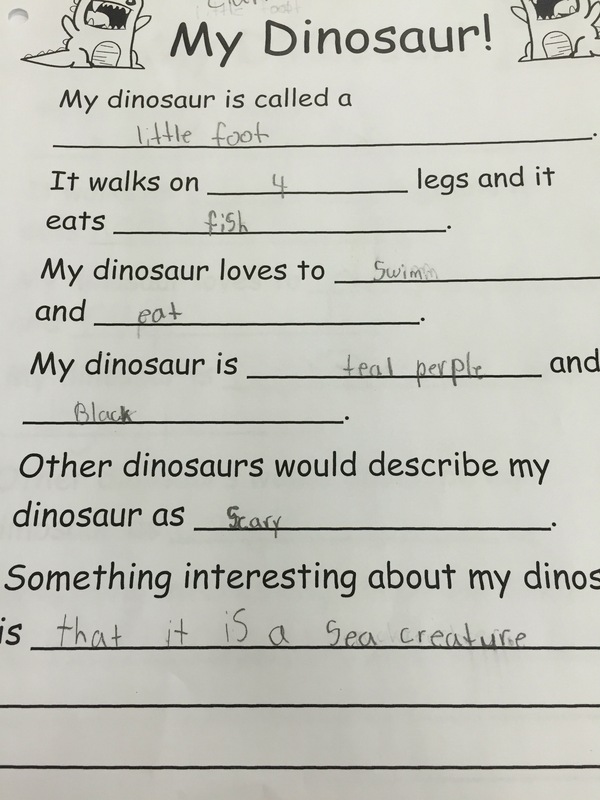 Students are all extremely different, and as such, all of their learning needs are different. This chapter felt, to me, like a justification for why we need to differentiate. Nothing rubbed me the wrong way, I’m just already on board with differentiation so the entire chapter felt like a sales pitch for something I already own. One point which did stick out to me was that children learn best with moderate challenge. If something is too easy, they’ll become bored and if something is too challenging, they’ll begin to lose hope and think they are “stupid”. The challenge as teachers is to find just the right point for where the child is at. Here’s to hoping chapter four is a little juicier! If you’re interested in learning more about the book, here’s a link to it on Amazon. 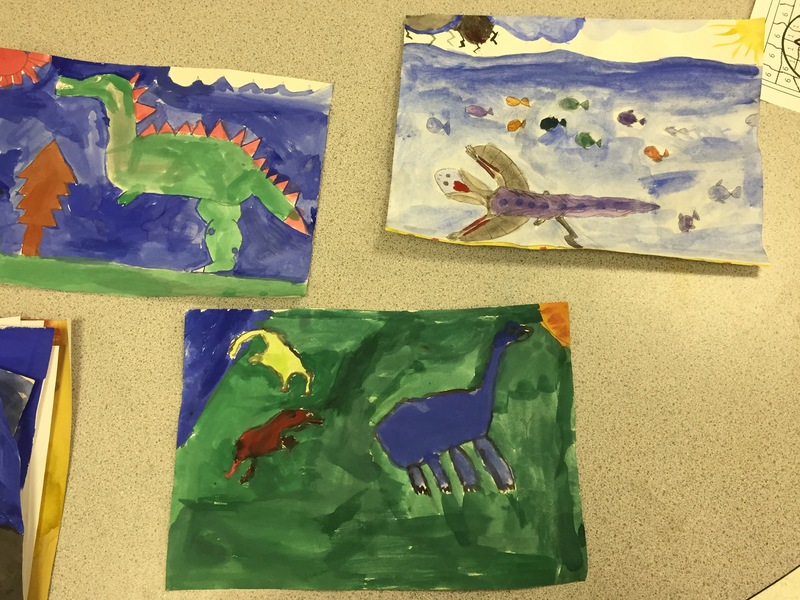 I wrote about beginning The Differentiated Classroom a couple of weeks ago and being excited to be able to encorporate ideas from it into my own classroom. 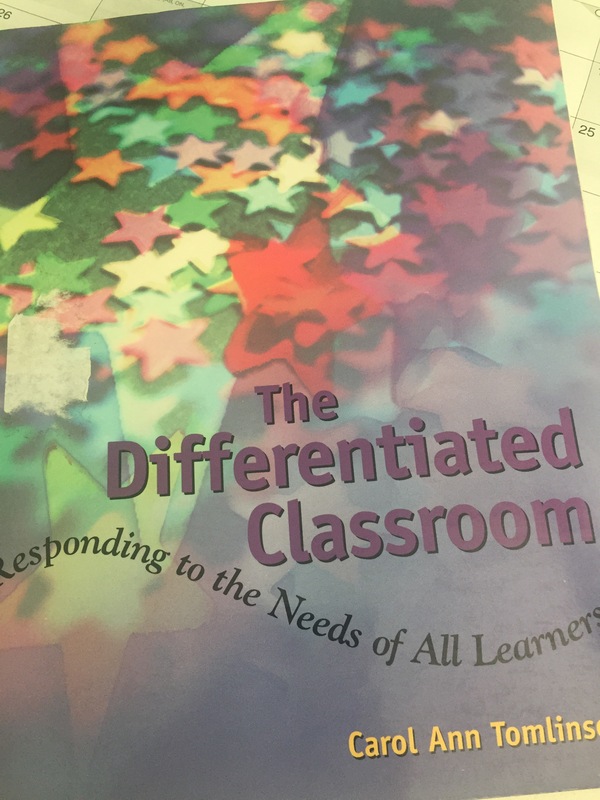 The first chapter was an introduction to differentiation and also provided some real classroom examples of differentiation in practice, which I appreciated. 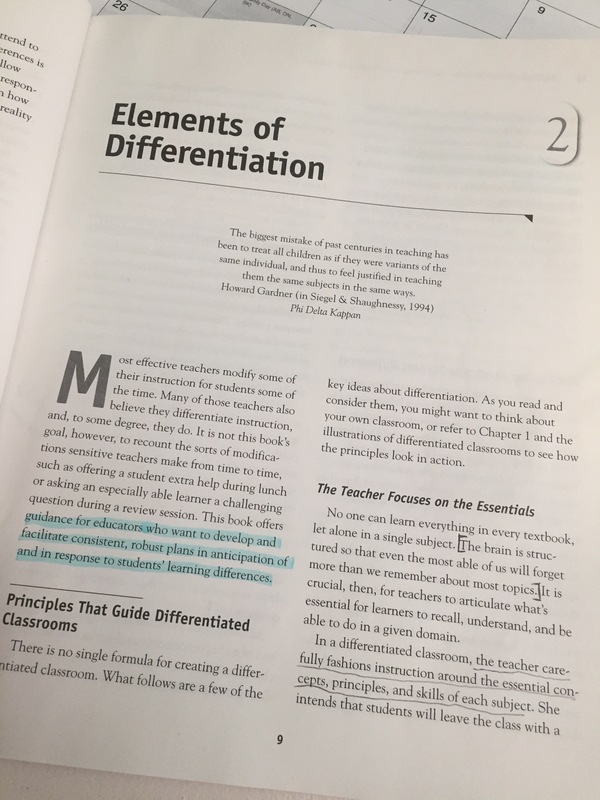 Chapter two is titled Elements of Differentiation and begins to introduce what a teacher must do in order to effectively differentiate his or her own classroom. It discusses the importance of teaching only the essentials, especially to struggling learners, who may become confused with too many useless facts. Also discussed is what the teacher can and should modify in the classroom and when. For example, if a student is becoming bored then something needs to be altered; the teacher can change the product outcome to suit a child’s interest or the process of learning to be driven in a different way. Also important was the discussion of assessment and instruction. Being able to use formative assessment in order to guide our teaching practice is a hot-button topic these days, and not without reason. 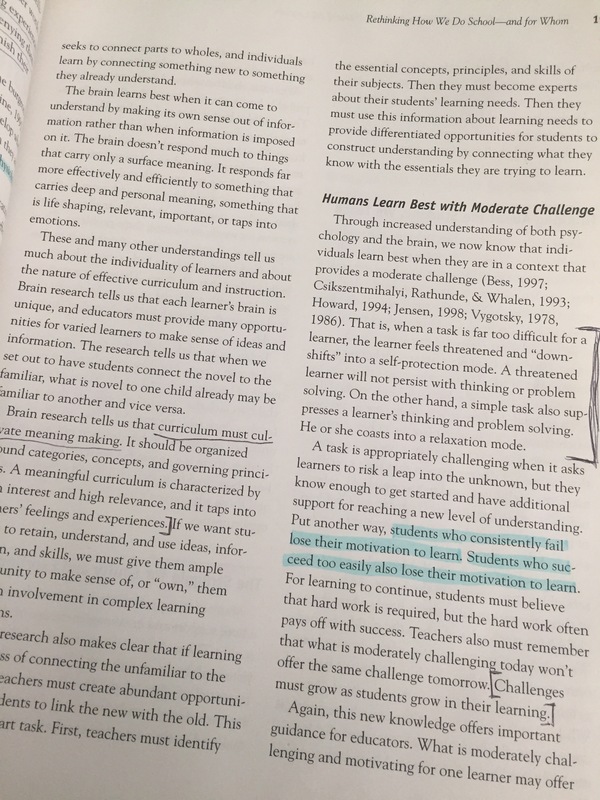 Assessment should be used to help the student and their learning, not to cause them anxiety or to eliminate any creativity from the teacher who has to “teach to the test”. There was also a great figure about differentiating instruction which listed some great ways to differentiate (which I what I’m always looking for)! If you’re interested in more information about the book, here’s a link to it on Amazon. Stay posted for chapter three!! It’s been a long while since I’ve posted and I thought it only right to begin with a new book. 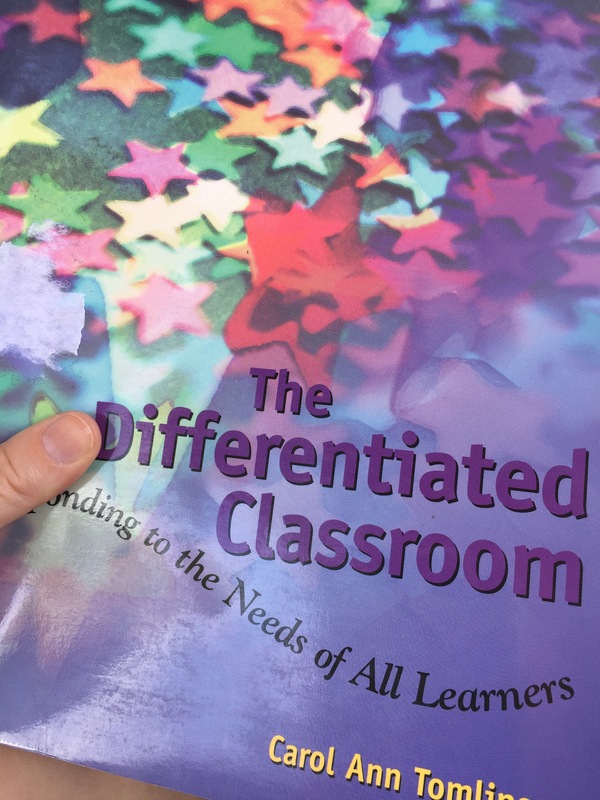 I’ve just begun The Differentiated Classroom by Carol Ann Tomlinson (I’m obsessed with differentiation and various ways to implement it). The book is nice and skinny with ten short chapters, so I’m excited to dive in and be able to start using the strategies right away. 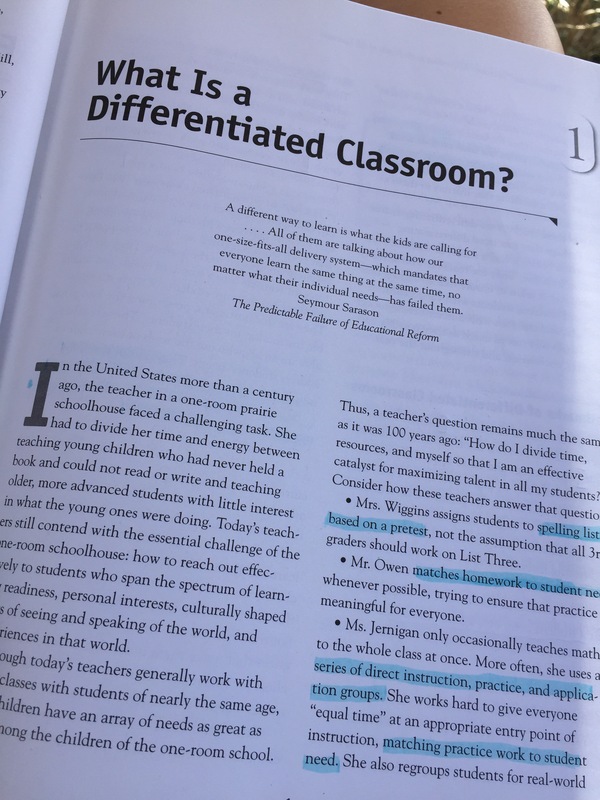 Chapter one begins with a brief introduction to differentiation and the fact that it may not have necessarily been called or considered “differentiation” in the past, but effective teachers have been using the strategies for years and years. 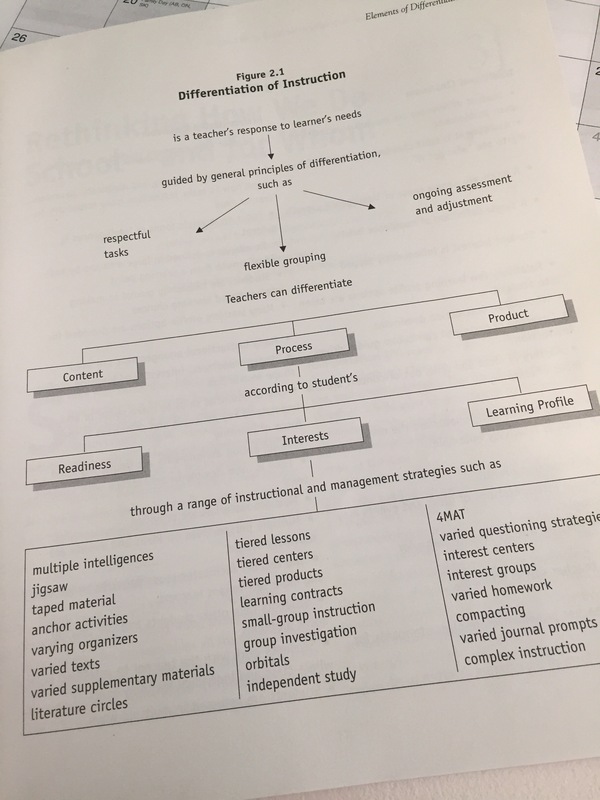 Tomlinson then goes on to compare different classrooms at various grade levels to effectively illustrate the glaring difference between a classroom where a teacher effectively differentiates class work and one that does not. 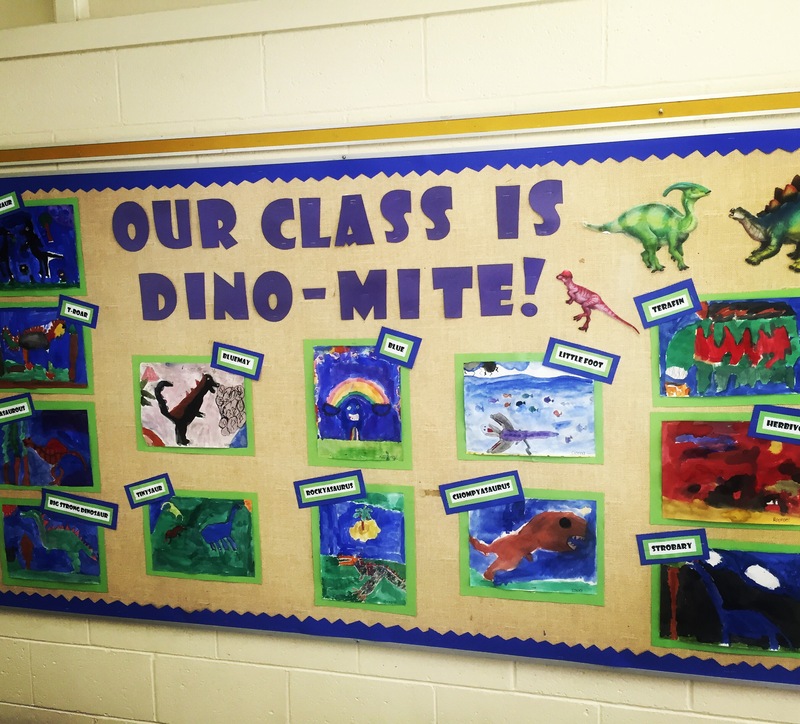 In my classroom, I do my best to differentiate absolutely everything in all subject areas. Of course, this is not always easy to do as it requires a huge initial time commitment to set everything up. Thankfully, over time it becomes easier to create new assignments and tasks which are differentiated for every student. I’m hopeful that this book will provide me with more ways to differentiate and ideas for implementation in my own classroom. If you’re interested in purchasing the book, here’s a link for it on Amazon. Stay posted for chapter two! 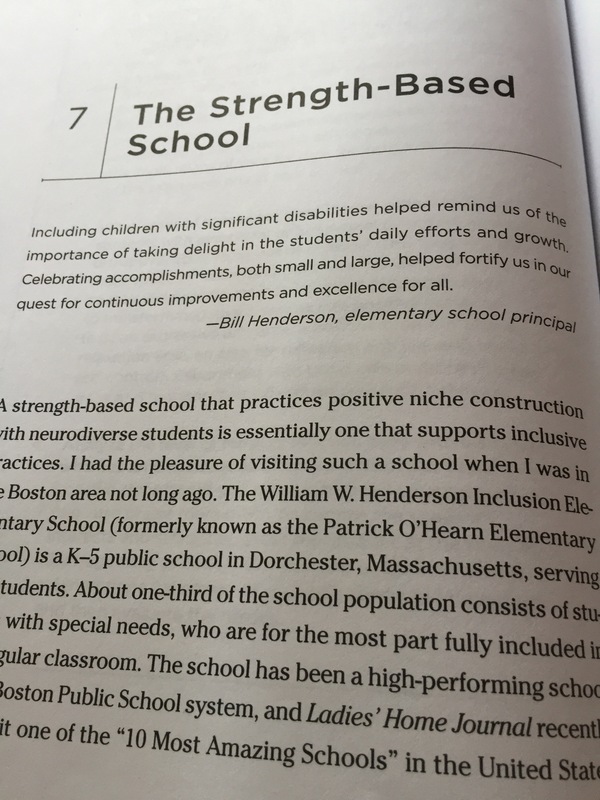 The final chapter in Neurodiversity in the Classroom pulls the whole book together by discussing “The Strength-Based School” in which all students are fully integrated and fully involved. The school used as an example throughout is the William W. Henderson Inclusion Elementary School, which sounds like a truly amazing school. Students with any sort of disability are integrated with “regular” students and allowed to shine. Students are always expected to do their best, no matter their disability. Indeed, there isn’t too much more to say pertaining to this chapter; its a very nice summary of the book as a whole and allows readers to think about putting everything into action. Also nice is a comprehensive “Neurodiversity Strengths Checklist”, which would be fun to do with students in any school. I hope you enjoyed reading Neurodiversity in the Classroom as much as I did, our next book will be The Truth About Testing. Hello, friends! 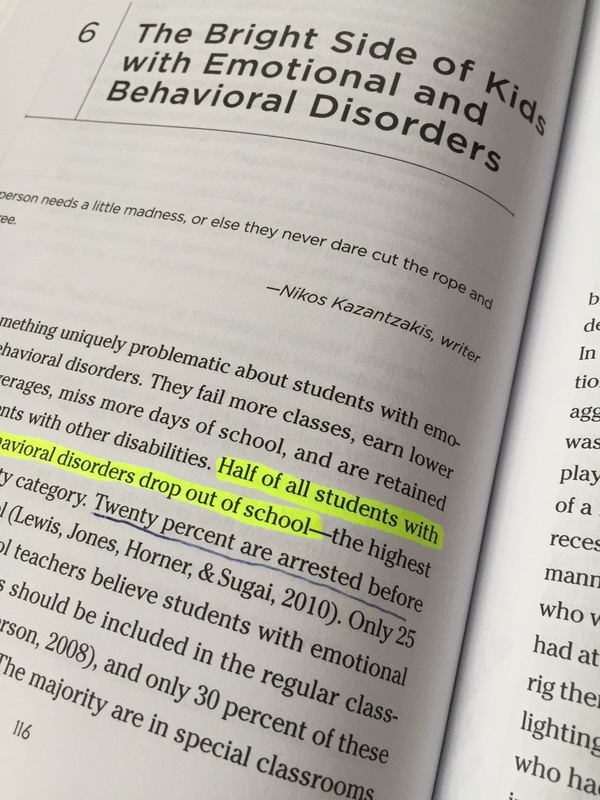 We’ve gotten to chapter six in Thomas Armstrong’s Neurodiversity in the Classroom. This one is about students with emotional and behavioural disorders. 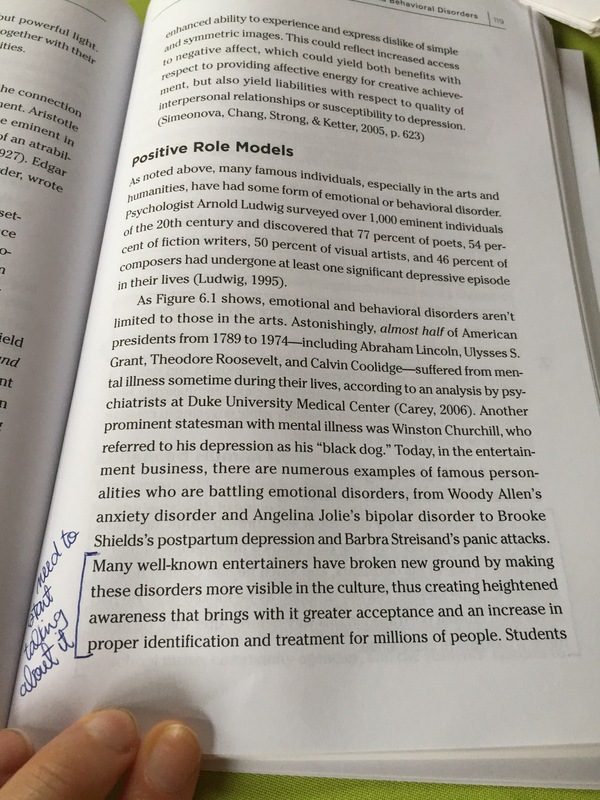 This chapter was a challenge for me because there are just so many various emotional and behavioural disorders that to lump them all together in one small chapter is no small feat. Indeed, Armstrong gives us as much information as he can in such a restrictive setting, but there’s still so much to read about and explore. Mental illness is still a disability that is rarely talked about, despite having a huge amount of people (young and old) who suffer from various mental illnesses. That needs to stop. We need to talk more and we need to talk more openly about mental illnesses in and out of the classroom in order to shine a light on them and help those suffering in silence. Because emotional and behavioural disorders are so difficult to identify, discuss, and (often) to treat, a staggering number of students drop out and those who do find employment find it difficult to hold onto a job. I have worked with several students with behavioural disorders and I can say that one major thing I notice that helps above all others is positive human interaction, wether it’s with a teacher, administrator, aid, etc. Unfortunately, due to the vast amounts of emotional disorders and their various components, I don’t feel knowledgeable enough to speak to them, though my gut tells me that positive human interaction is probably just as helpful for those individuals. As I mentioned previously, I felt that Armstrong did what he could in this chapter, but still only touched vey lightly on the vast world of emotional and behavioural disorders. Still, it was informative and helpful in a broad and general sense and I will definitely be able to pull out advice for my own use in the classroom. If you’re interested in the book, here is a link to it on Amazon. We’re almost at the end, folks! Chapter seven is coming up, happy reading! Well hello again, friends! 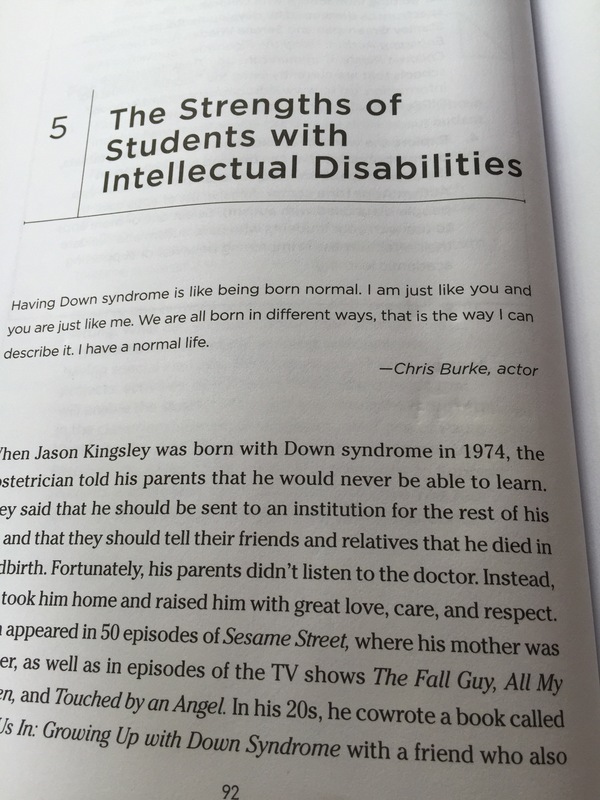 We’ve hit chapter five in Neurodiversity in the Classroom by Thomas Armstrong, which is all about the strengths of students with intellectual disabilities. I have had the pleasure of working with a few adults with Down syndrome through university and already know quite a bit about their strengths and other positive attributes. However, as far as teaching goes I am extremely inexperienced. During my practicing, I had a student with Down syndrome in the class, but was unfortunately not given a chance to really cater to his educational needs as my mentor teacher had prepared all of his personalized lessons. However, he was fully in an integrated classroom and listened and participated in whole-class lectures before class work was assigned. 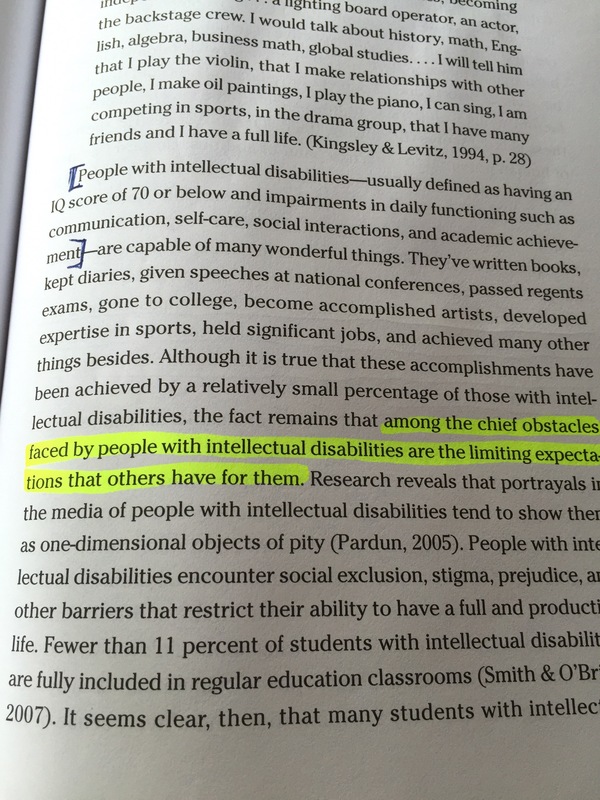 The most intriguing (and accurate) quote I found in this chapter stated that the largest obsticle faces by individuals with intellectual disabilities is that others place low expectations on them. Indeed, if society continually tells someone they are unable to do something, chances are they’ll start to believe it themselves and may not even try. This frustrates me hugely as I believe all people should be given the opportunity to succeed and find their own happiness. 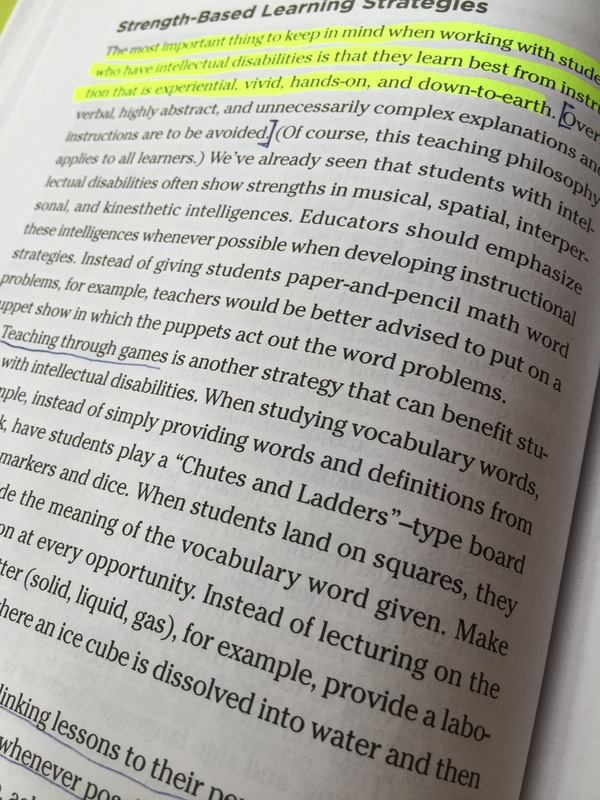 Further discussed is also how to best teach individuals with intellectual disabilities. I found this helpful as many of the tips relate to my students with learning disabilities as well, such as playing games and linking lessons to personal lives. It’s a fun way to teach curriculum, life skills, and communication. If you’re interested in knowing more about the book, here’s the link to it on Amazon. Stay tuned for our next chapter and happy reading!